My "not so" Simple Life: Guaranteed to get your kids brushing their teeth. Guaranteed to get your kids brushing their teeth. Recently my husband had to get his back molar pulled. He brushes "with love", but this tooth has always given him trouble. So, it had to go. He always says he is taking all his teeth with him to the grave, so he asked the dentist to give him his tooth. We preaches to our kids the importance of good dental hygiene. 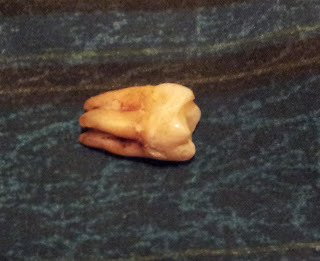 And when he came home with this tooth he decided to use it as a teaching tool. If it could happen to him, when he brushes his teeth regularly, he warned them that they could have it worse if they don't keep up with their brushing. He noticed how uncomfortable the kids were around the tooth, they didn't want to look at it or touch it. A few days later he noticed a couple of the kids had not brushed their teeth that day and it was late afternoon. So he decided to implement a new tooth rule. He sat them down and made them each hold the tooth for five minutes and inspect it. To better understand the importance of good brushing. Then he sent them up to brush their teeth. Afterwards he brought all the kids in and showed them the tooth again. He explained to them that if they did not brush their teeth without being told to, they would have to hold the tooth for five minutes, go back brush their teeth, then return for an inspection. Incidentally, our children's teeth have never looked so sparkly. My poor husband loosing his tooth is the best thing to happen to the kids teeth! don't blame them for being scared looks creepy LOL..
LOL, I agree. When he first told me what he was going to do, I thought he was crazy. But I can't argue with the results!